Editor's note: MousePlanet's extensive coverage of last week's rededication of Disney California Adventure could not have happened without the contributions of a large team of staff members, both in person at the Disneyland Resort and also providing behind the scenes support from as far away as San Francisco and New York. Special thanks to Jeff Moxley, Steven Ng, Tony Phoenix, Frank Anzalone, Andrew Rich, Jennifer Rich, Britt Winslow, Lani Teshima and Stephanie Wien for your efforts. 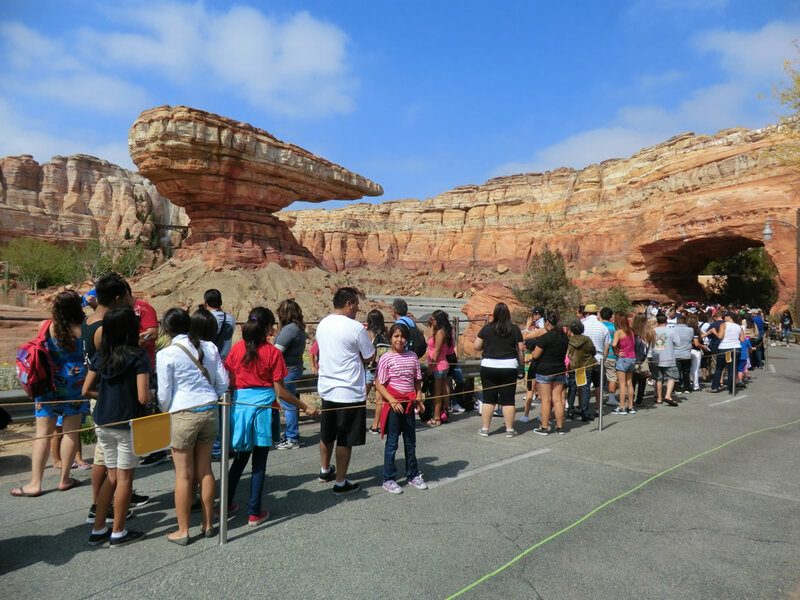 Friday, June 15 - Disney California Adventure Grand Reopening and Cars Land opening day crowd reports. For more on the Cars Land red carpet, including celebrity photos, read our Cars Land Grand Opening Celebration recap. 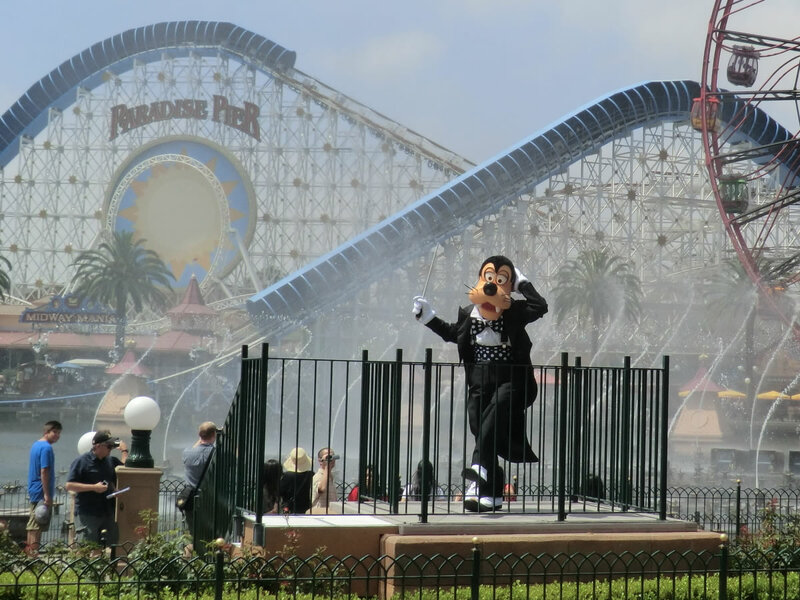 The rededication of the "new" Disney California Adventure (dubbed DCA 2.0 by some) means a fresh start for the beleaguered theme park, which has suffered from poor word-of-mouth and low attendance since opening in 2001. Thousands of fans waited outside DCA's gates Friday morning to see the changes first hand, and many praised Disney managers for how well they handled the opening day crowds. Disneyland Resort President George Kalogridis was highly visible throughout DCA during the entire opening weekend, often accompanied by Meg Crofton, President, Walt Disney Parks and Resorts Operations, U.S. & France. Pixar chief John Lasseter was also on hand during the weekend, greeting the first official Radiator Springs Racers riders Friday morning and browsing Buena Vista Street shops Saturday. 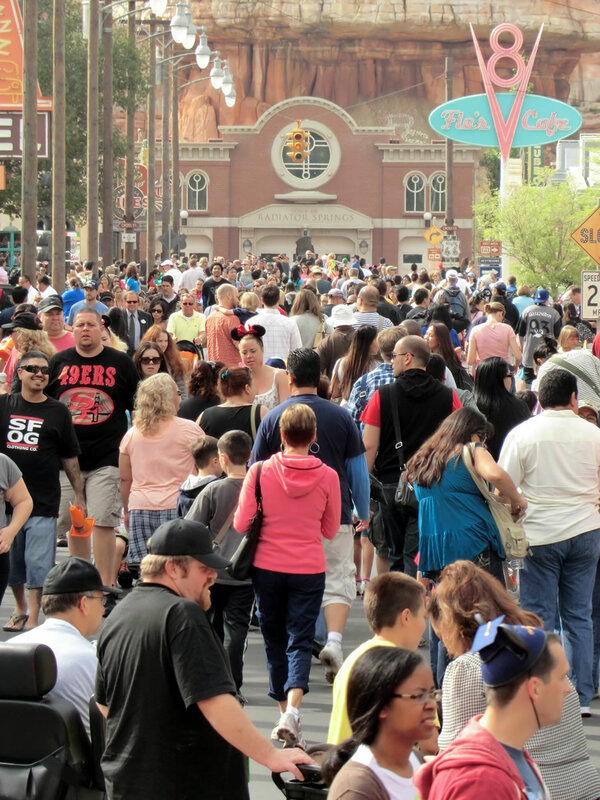 Hundreds pack Route 66 during the opening hours of the new Cars Land in Disney California Adventure. Photo by Adrienne Vincent-Phoenix. As expected, the majority of early arrivals headed straight to Cars Land after the rededication ceremony, some splitting off to first grab a Fastpass ticket for the new Radiator Springs Racers attraction. Route 66, the central road through Cars Land, became grid locked in a matter of minutes, with cast members scrambling to direct guests into the prepared extended queue for the three new rides. At one point, the line for Radiator Springs Racers snaked as far back as the Paradise Pier bridge, with an estimated wait time approaching six hours. The other two new rides also boasted impressive wait times, with the line for Luigi's Flying Tires running as long as three hours. Park guests waited as long as six hours to ride Radiator Springs Racers during the opening weekend of Cars Land. Photo by Adrienne Vincent-Phoenix. Elsewhere in Cars Land, lines also formed for the three new stores and two new eateries, with the wait to buy flavored popcorn from the new Cozy Cone Cafe topping out at almost an hour. With most walkways still bumper-to-bumper with eager tourists well into the afternoon, managers quickly moved the meet-and-greet with Lightning McQueen and Mater to the less-trafficked path leading to a bug's land, and cancelled some of the drive-through entertainment planned for Route 66. Walt Disney Company Chairman and CEO Robert Iger, Walt Disney Parks and Resorts Chairman Tom Staggs, Cars director and Principal Creative Advisor for Walt Disney Imagineering John Lasseter and celebrities from the Cars movies take the stage at the grand opening ceremony for Cars Land on June 13. MousePlanet video by Jeff Moxley and Steven Ng. Despite predictions of another "carmageddon" and worries that DCA might reach capacity, the two theme parks were not unusually busy outside of Cars Land and, to a lesser degree, Buena Vista Street. Over at Disneyland, the longest line was for the newly reopened Matterhorn Bobsleds, but MousePlanet staff writer Andrew Rich said the rest of the park felt "light for a summer weekend." The crowds weren't much smaller in Cars Land the second day. Photo by Adrienne Vincent-Phoenix. Saturday saw a repeat of Friday's traffic pattern, with a good sized crowd waiting outside DCA for their chance to see Cars Land, and lighter-than-normal crowds at Disneyland. Sunday was expected to be the busiest of the weekend days, with only the lowest level of annual pass blocked out, but there were no reports of any capacity issues at either park. Disney Chairman and CEO Robert Iger rededicates Disney California Adventure at a ceremony on June 15, 2012. MousePlanet video by Jeff Moxley and Steven Ng. Some are likely to characterize anything less than a completely-full Disney California Adventure as proof that even a billion dollar makeover can't save the park, but it's way too early for such nonsense. 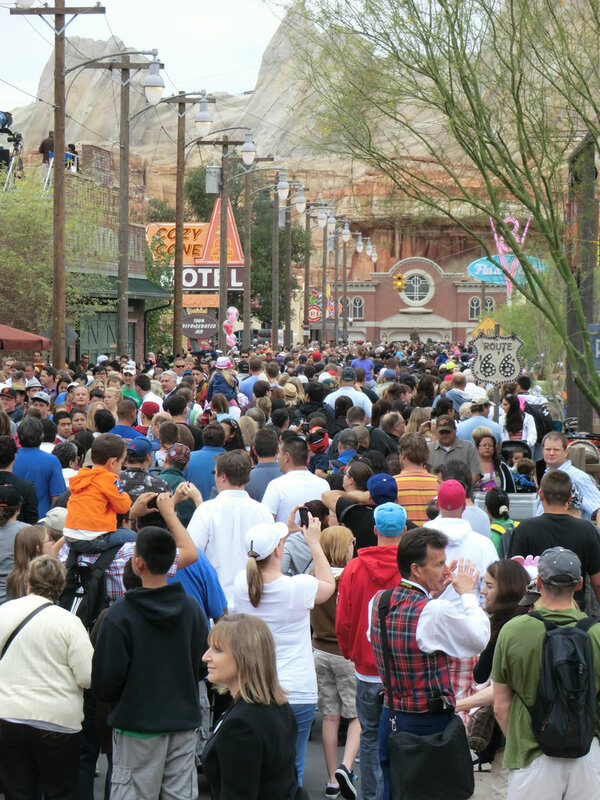 After Disneyland filled to capacity during the much-hyped One More Disney Day event, locals may have been hesitant to visit Cars Land during the opening weekend, preferring to wait a few weeks until things settled down. The city of Anaheim even issued an "Anaheim Alert" warning residents of expected large crowds due to the grand opening. 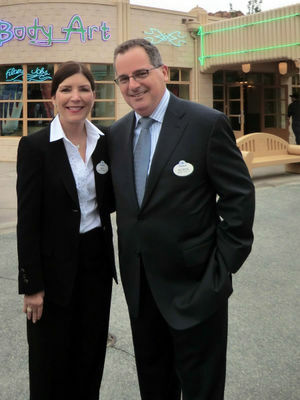 Walt Disney World Resort President Meg Crofton and Disneyland Resort President George Kalogridis at the opening of Cars Land in Disney California Adventure. Photo by Adrienne Vincent-Phoenix. From the reactions of the media, passholders and day guests who visited Cars Land and Buena Vista Street this week, the new DCA is a hit. It may take a few months or even longer for word to spread, and for the new offerings to erase 11 years of memories of the original Disney California Adventure, but DCA's future looks as bright as the paint on a Cozy Cone. For those planning to visit Cars Land, here is our best advice to minimize (notice we didn't say avoid - there's no getting around that) the lines for the three new attractions. Plan to arrive at Disney California Adventure early, at least by 7:30 a.m. If park managers open the main entrance a bit early (as they did all weekend), follow the crowd to Cars Land, but stay to the left and get in line for the Radiator Springs Racers Fastpass distribution, currently located outside a bug's land. Once you have your Fastpass, and while the rest of the crowd fills the queue for Radiator Springs Racers, head straight to Luigi's Flying Tires for what will likely be the shortest wait of the day. Then take a spin on Mater's Junkyard Jamboree. Depending on when your Fastpass return time is, this is a perfect opportunity to grab breakfast at Flo's V8 Cafe, or head to Paradise Pier and ride Midway Mania with a minimal wait. Friday's reopening of Disneyland's Matterhorn Bobsleds, the park's original E-ticket attraction, was overshadowed by all of the attention focused on the official grand opening of Cars Land and Buena Vista Street across the way at Disney California Adventure. Though few of the media invited to cover DCA's grand rededication were even told about the newly refurbished ride inside Disneyland, fans of the iconic attraction raced to see what had changed during the five-month refurbishment, as soon as word leaked out Thursday evening that the ride had "soft opened" early. With redesigned ride vehicles and a new paint job, the changes to Disneyland's first mountain are the closest thing to a new attraction the original Disney park will see for Summer 2012. And though most of Disneyland was unusually empty over the weekend due to the rush to see Cars Land, the lines for the new Matterhorn hovered around an hour. After a five-month refurbishment the Matterhorn Bobsled attraction opened last week to kick off the summer season in Disneyland. Photo by Britt Winslow. The most obvious difference is the bobsleds. The former vehicles had two seats per bobsled offering riders an opportunity to sit two to a seat in single-row fashion. The new vehicles are three individual seats per bobsled. The new bobsleds, like the old, travel in trains of two. The new seating configuration means the ride now has a 42-inch height requirement, up from the previous 35-inch minimum. Guests now slide through the Matterhorn in the sleek new three seat bobsleds. Photo by Britt Winslow. So far, there have been some mixed reviews about the new vehicles. Some thought the ride was smoother, while others thought the new seats are a little uncomfortable. One noticeable difference about the new bobsleds is the reduced leg room. The old sleds allowed a taller guests to have a few options for their legs. For example, if you rode by yourself, you could stretch your legs out to the front of the sled with reasonable comfort. The three seats in the new sled are closer together than its predecessor, and the guests sitting in positions two and three have to put their feet on either side of the seat in front of them. Even shorter riders need to keep their knees slightly bent, but for taller riders, their knees would be almost touching their chests for the entire ride. In addition, women wearing skirts may find it uncomfortable to try to keep their knees together when their feet are spread wide apart. 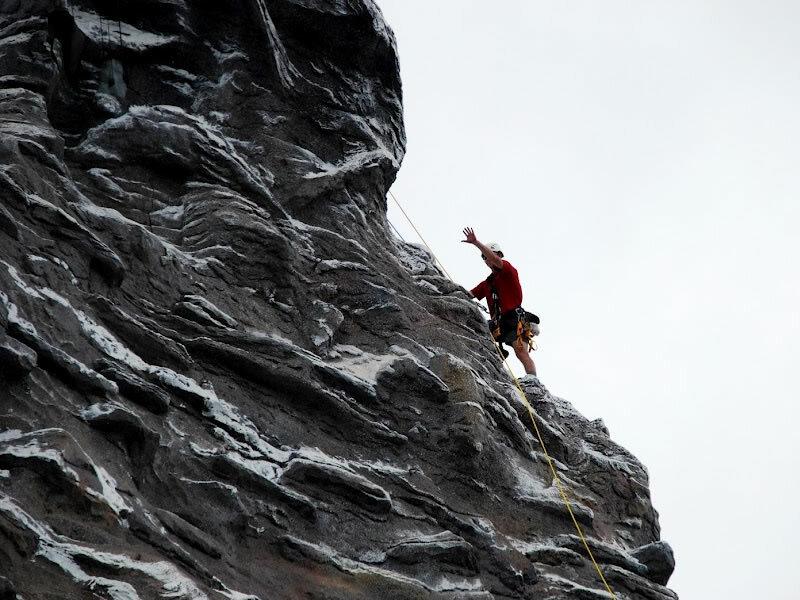 A climber scales Disneyland's Matterhorn Mountain. Photo by Andrew Rich. 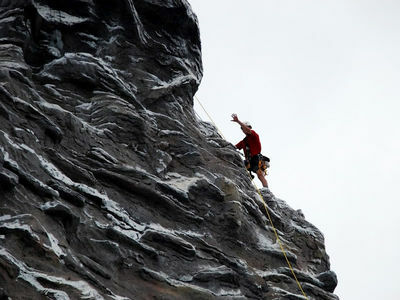 New paint isn't the only thing to notice on the slopes of the Matterhorn, as the mountain climbers have also returned. Always a guest favorite—though some will argue they ruin the forced perspective of the mountain—climbers will ascend to and descend from the summit throughout the summer season. The climbers don't currently appear on the park's entertainment schedule, so listen for the announcements on Main Street. Have you visited the new Matterhorn Bobsleds yet? Share your thoughts on our MousePad discussion board. 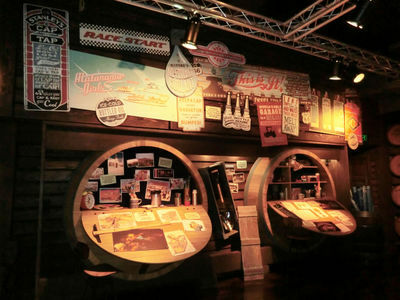 Now that Cars Land is open, the Blue Sky Cellar has served its purpose as a preview center for the new land, and now features a new exhibit, installed earlier this month, that showcases artifacts from the Museum of the History of Radiator Springs, as presented by the fictional Radiator Springs Historical Society. The new Blue Sky Cellar exhibit focuses on the founding of Radiator Springs. Photo by Adrienne Vincent-Phoenix. Concept art from Cars Land still adorns the walls of the cellar, and the enormous scale model of the 12-acre expansion and smaller maquettes of the ride vehicles and characters are still displayed. But a new collection of "artifacts" give insight into how much effort Pixar writers and Disney Imagineers put into creating a whole backstory for Radiator Springs that was then incorporated into the design of Cars Land. 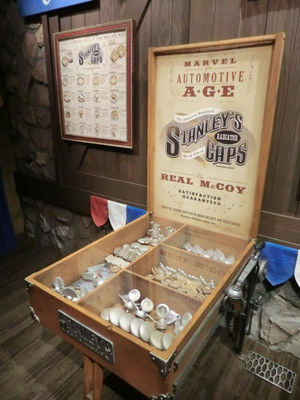 Included is the display case carried by Stanley (traveling radiator cap salesman and founder of Radiator Springs), a poster from Fillmore's visit to "Burning Van;" Sarge's honorable discharge papers, some of Flo's Motorama Girls souvenirs, and Doc Hudson's automotive-themed caduceus. Props include Stanley's display case from his days as a traveling radiator cap salesman. Photo by Adrienne Vincent-Phoenix. One small display case is filled with Radiator Springs souvenirs that you cannot buy in any of the Cars Land stores, including bumper sticker and post cards. A cast member says that visitors have been begging to buy the items, and hopes Disney's merchandise department is working on making some of them available for sale. 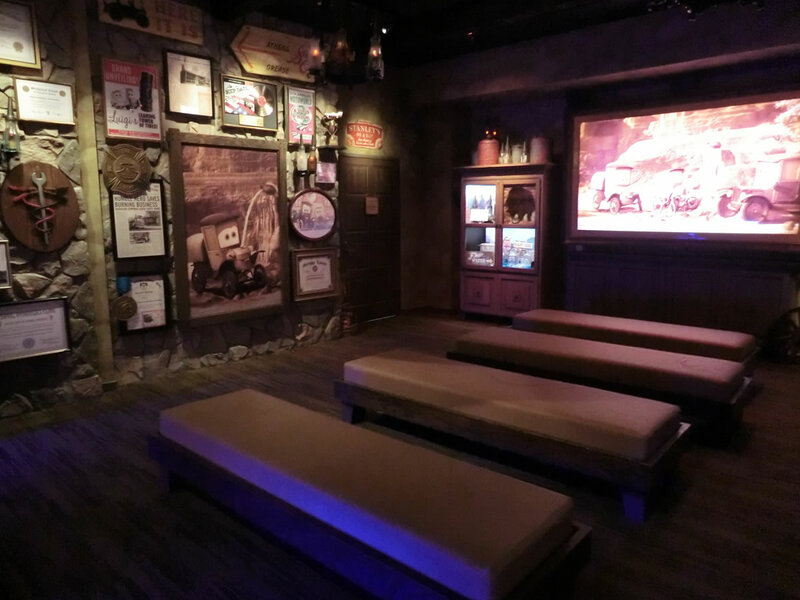 Photos, documents and not-available-for-sale souvenirs from Radiator Springs history are displayed in the Blue Sky Cellar Photo by Adrienne Vincent-Phoenix. The Blue Sky Cellar also plays the full-length "Time Travel Mater," an animated short created by Pixar to help tell the tale of Radiator Springs as seen in Cars Land. Here we learn how Stanley came to found Radiator Springs and meet his future wife Lizzy (their wedding photo hangs in the Blue Sky Cellar; there is also a copy in the Radiator Springs Racers queue). Disney has posted a short clip of the movie on YouTube, but you'll have to go to DCA or hope for a network television rerun on ABC to see the whole thing. Disneyland's Carnation Cafe reopened on Main Street, U.S.A. last week, marking the end of a six-month refurbishment project on the west side of the street, and bringing the history of this location full circle. Longtime readers may know that the Carnation Cafe started out as the Carnation Ice Cream Parlor restaurant. The ice cream parlor closed in 1997 with the opening of the Gibson Girl Ice Cream Parlor, and the location was split into two separate restaurants—the indoor portion became the Blue Ribbon Bakery, and the patio became the Carnation Cafe. With the opening of the Jolly Holiday Bakery Cafe in January, the Blue Ribbon Bakery was closed, and the space reclaimed by the Carnation Cafe for use as an indoor seating area. The host stand has been moved back inside, and a new waiting area provides a place to sit out of the sun until your table is ready. A new shade structure on the south edge of the patio and oversized umbrellas, patterned like a stylized carnation, provide at least partial shade to most of the tables on the patio, though some seats are still in full sun. Carnation Cafe on Main Street, USA has reopened and expanded just in time for the summer season. Photo by Britt Winslow. Carnation Cafe serves breakfast, lunch, and dinner, and remains the only table service option for breakfast in Disneyland. All of the menus have been dramatically revised, with some guest favorites returning, but many others missing. The breakfast menu still has Oscars Choice: The Cafe Scramble, Mickey-shaped waffles, and apple-granola pancakes. Some of the new menu items include huevos rancheros, steel-cut oatmeal cakes, and a spinach and tomato egg white frittata, to name a few. Gone are the Croissant Benedict and the Cinnamon Roll French Toast. Specialty hot beverages like cappuccino, caffe latte and hot chocolate are still offered. Guests can now enjoy indoor seating at the Carnation Cafe in the space formerly occupied by Blue Ribbon Bakery. Photo by Britt Winslow. The lunch/dinner menu has been changed considerably with the baked potato soup and homemade meatloaf being the only holdovers. The new menu has three burger options, including a green chile cheeseburger, complete with a fried egg. There is also the Chef's Vegan Burger and the more traditional Main Street Cheeseburger. Look for a sustainable fish fresh catch of the day entree, chicken-fried chicken, and a new grilled chicken salad with warm pancetta mustard seed vinaigrette. A new awning has been added to the patio at Carnation Cafe allowing guests to dine al fresco in the shade. Photo by Britt Winslow. Two of the most interesting new menu items come from the beverage section of the menu. Adventurous guests can try a Chocolate-Cherry Coke, or a PB&J soda made with Sprite and flavored with grape and peanut butter syrups. 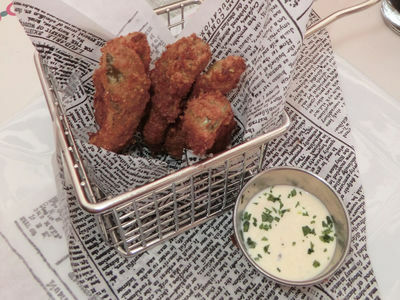 Fried dill pickle spears are the newest addition to the appetizer menu, and are served in a small replica fryer basket with a side of house sauce (sriracha hot sauce-spiked ranch dressing). 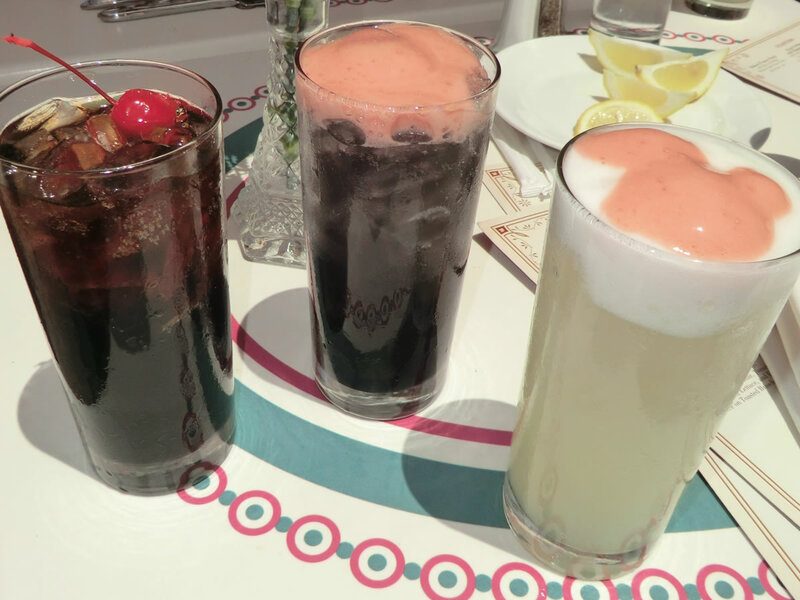 New additions to the Carnation Plaza drink menu include Chocolate-Cherry Coke, PB&J soda and lemonade with citrus foam. Photo by Adrienne Vincent-Phoenix. Carnation Cafe is open during normal Disneyland operating hours, with breakfast being served until 11:00 a.m. Reservations are available up to 60 days in advance by calling (714) 781-3463, or by sending a request via e-mail to dine@disneyland.com. E-mail requests should include the restaurant you want to book, the date and meal period (breakfast, lunch, dinner) you're seeking, the number of adults and children in your party, and your name and phone number. The Carnation Plaza appetizer menu now features deep-fried dill pickle spears. Photo by Adrienne Vincent-Phoenix. Along with the reopening of the Carnation Cafe and Matterhorn at Disneyland, the Resort's summer entertainment line-up for 2012 seems to also have been eclipsed by the laser focus of Disney's PR department on the Cars Land opening. But for those guests willing to drag their attention away from the admittedly stunning Cadillac Range and Buena Vista Street, there is a vast schedule of entertainment in both parks to keep you entertained while you're waiting to ride Radiator Springs Racers. In fact, Disneyland and Disney California Adventure now have so many entertainment offerings that each park once again has its own printed schedule; be sure to pick up a copy when you enter the main gate. The front of the newly designed schedule lists highlights for each park, while the inner pages give a land-by-land breakdown of performing groups and character appearances. 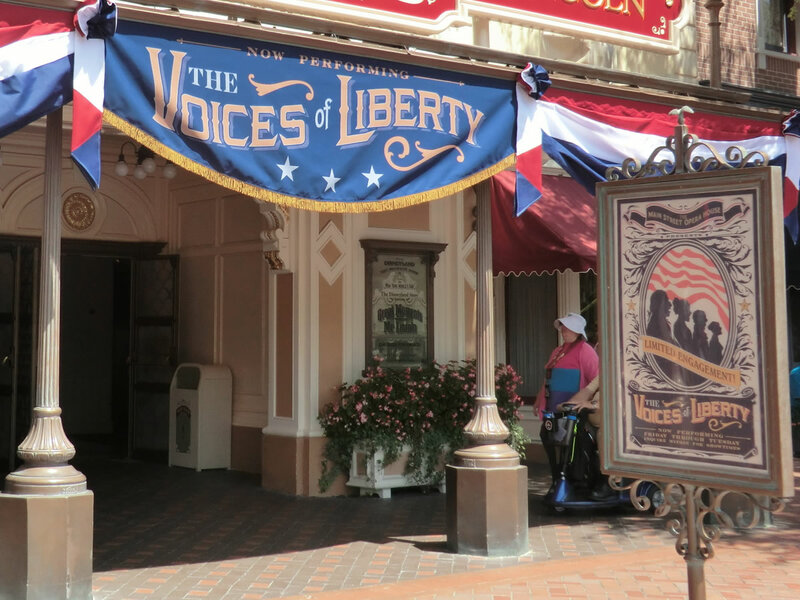 The Voices of Liberty made their West Coast debut on June 15 for a limited engagement currently scheduled to end September 16. The a cappella group performs Friday through Tuesday in the lobby of Disneyland's Main Street Opera House. Showtimes are currently 11:00 a.m., noon, 1:00 p.m., 2:00, 3:00, 4:00 and 5:00; holiday schedule may vary. A sign outside the Main Street Opera House advertises the limited engagement of The Voices of Liberty. Photo by Adrienne Vincent-Phoenix. 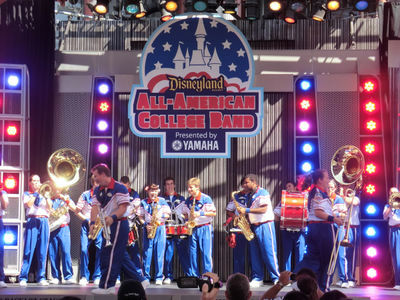 The Disneyland Resort All-American College Band also returned this week for their summer season. The group of 21 college musicians from around the country perform Friday, Saturday, Tuesday, Wednesday, and Thursday. Catch them outside Sleeping Beauty Castle 2:00 p.m., on the Disneyland parade route at 6:00 p.m., or in Town Square at 7:15 p.m.. The band also performs during the nightly flag retreat, and even crosses the esplanade to perform in Hollywood Land at Disney California Adventure. 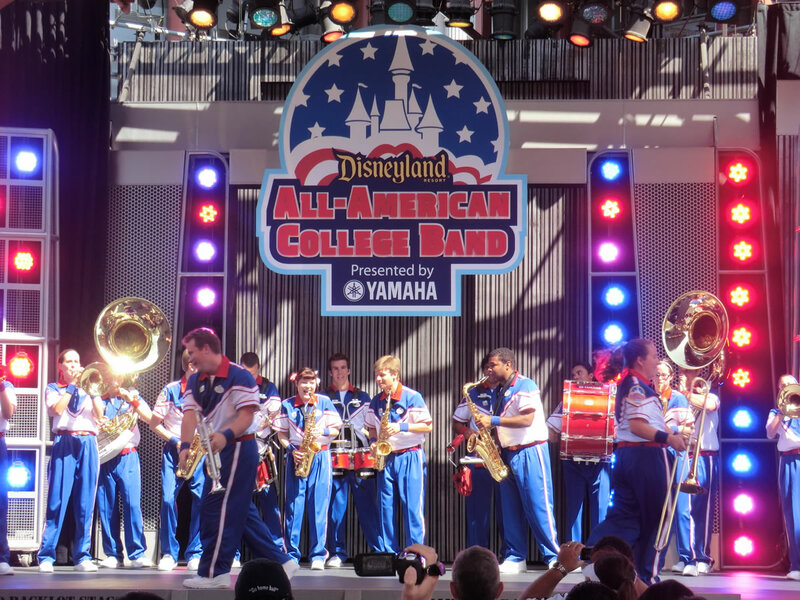 The All American College Band has returned for another summer at the Disneyland Resort. Photo by Adrienne Vincent-Phoenix. Disneyland also has all of the usual summer entertainment spectaculars, including Mickey's Soundsational parade, Fantasmic, the Magical fireworks show and the summer version of The Magic, The Memories and You. The Red Car News Boys perform six times per day on Buena Vista Street, arriving on a Red Car Trolley and leaving with a new friend. Inspired by the Disney musical Newsies, the show features its own signature song "A Suitcase and a Dream," then ends with "Seize the Day" from Newsies. 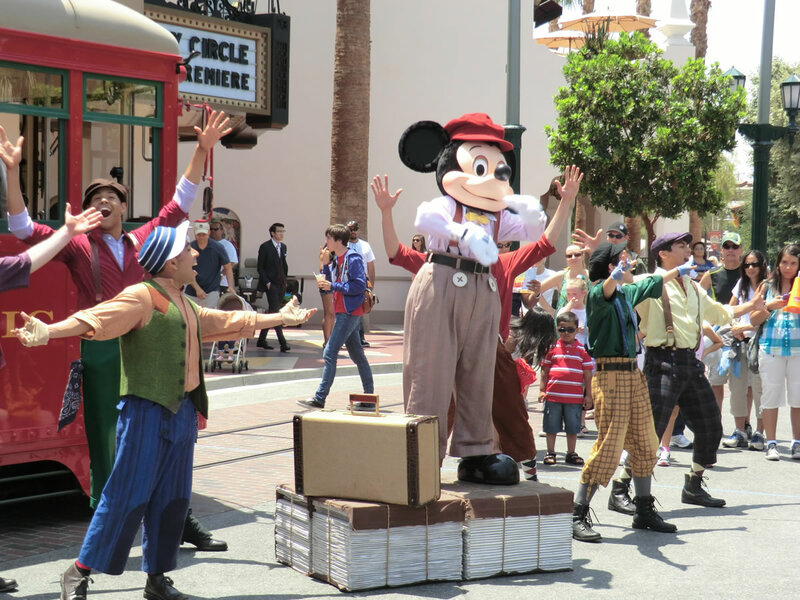 Red Car News Boys is a Newsies-inspired show with an appearance by Mickey Mouse. Photo by Adrienne Vincent-Phoenix. Buena Vista Street also hosts Five and Dime, a jazz group that performs eight times per day outside the Carthay Circle Theatre. The set includes a mix of jazz standards and period songs, and features an audience participation moment as children dance to "Who's Afraid of the Big Bad Wolf." Instant Concert... Just Add Water uses the World of Color fountains for a new daytime show. Six times per day, a tuxedo-clad Goofy attempts to conduct the fountains in a brief concert, with predictable results. The show is just five minutes long, but worth seeking out. Maestro Goofy conducts the World of Color fountains with his usual skill and style. Photo by Adrienne Vincent-Phoenix. Cars Land features two brief shows, Red to the Rescue and DJ's Dance 'n' Drive. Both shows take place on Route 66, and may be moved or canceled based on crowding in Cars Land. Perhaps the best new offering for younger visitors is Dancin' with Disney, held daily from 1:00 to 5:00 p.m. inside Stage 17 in Hollywood Land. Dancin' with Disney is an informal dance party with Disney characters, including some seldom-seen personalities older Disney fans may want to meet. 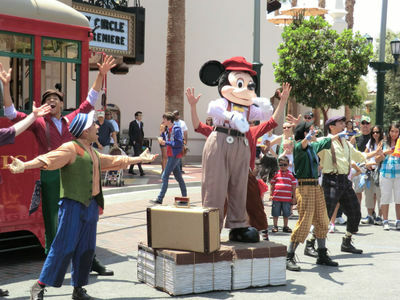 A new group of characters arrives every 30 minutes and dances with the audience for about 15 minutes. A DJ keeps the music going in between sets, and there are Disney dance hosts around to encourage children to participate. 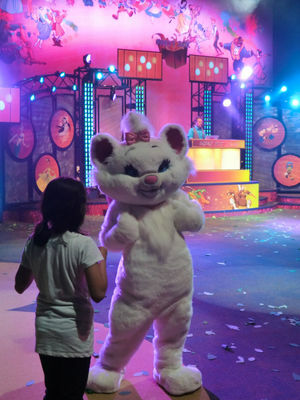 Marie from The Aristocats shows off her moves at the Dancin' with Disney venue. Photo by Adrienne Vincent-Phoenix. The characters alternate between a Villains-centric grouping (spotted this past weekend were Jafar, Queen of Hearts, Big Bad Wolf, Captain Hook, Smee, Prince John and the Sheriff of Nottingham) and an all-female assortment (we saw Lilo, Marie, Clara Cluck, Clarbelle Cow, Clarice, Daisy, Drizella and Anastasia). A collection of plastic couches around the dance floor lets parents rest while their kids blow off some energy. This is not an autograph opportunity, but instead lets you interact with the characters in a manner not usually available in the theme parks. World of Color continues with twice nightly performance through the summer, and Disney may add a third performance on days with high attendance. 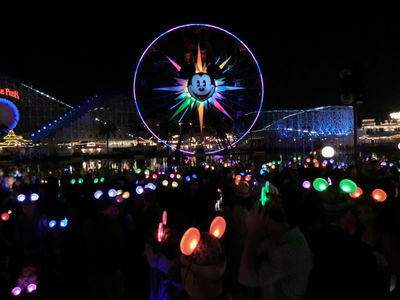 I reported last week that Disney had invited passholders to try out the new Glow with the Show ear hats during upcoming after-hours performances of World of Color. I described the event as a test, which sources in merchandise tell me is not the case. The new ear hats went on sale to the general public last Friday, and the interactive feature is now active at World of Color and the Mad T Party, with readers reporting that the ears also seem to react to some locations in Cars Land, as well as to the Soundsational Parade in Disneyland. A demonstration for the media shows how an audience full of Glow with the Show ears lights up Paradise Pier before the World of Color show Photo by Adrienne Vincent-Phoenix. Disney also distributed the new ears to invited guests during the recent Cars Land media event, allowing us the first look at how the new technology enhances the show. You can see the effect in our video below, which also includes the debut of the new Brave segment added to promote the upcoming Disney Pixar film. 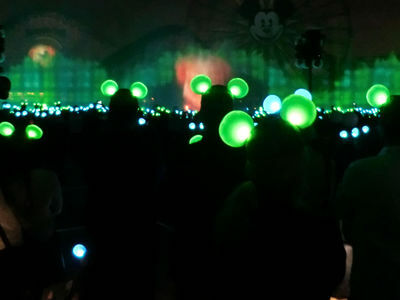 Disney demonstrated the new Glow with the Show ears during the debut performance of the new Brave addition to World of Color. MousePlanet video by Jeff Moxley and Steven Ng. When originally announced, I expected to like these new ears about as much as I like most glow product Disney sells, which is to say not very much. Between glowing balloons that block views of the fireworks and Fantasmic, spinning toys that ruin the effects of dark rides like the Haunted Mansion, and random glow sword fights on Main Street, nighttime at Disneyland can be frustrating. The sight lines at World of Color are already problematic enough without having the person in front of me being made even taller by a hat that randomly blinks throughout the whole show. Fortunately, the Glow with the Show ears are synchronized to the show, and are dark for most of it (yes, Disney can turn them off remotely, and we've been told the hats won't light up inside the Haunted Mansion). The ears light up at specific moments during the show, changing colors together and blinking in time to the music. They are used much like the light fixtures and pop jets throughout the World of Color viewing area, as an accent to the show. When the entire audience is wearing the hats, the ears somewhat replace the water-level light effects that most guests can't see. Many writers who attended the media preview seemed to agree that, in a less-than-full house, and when everyone has the hat, the effect is stunning. Disney's new Glow with the Show ears light up in time to the World of Color show. Photo by Adrienne Vincent-Phoenix. However, many of those same writers returned to see the show the next night and said the effect is much less interesting when only a few folks in the audience have them on. In fact, rather than a test, the Annual Passholder events could be better described as a viral marketing effort. Disney will hand out thousands of the hats, regularly priced at $25 a pop, during the three exclusive events. The company is likely banking on those passholders coming back and wearing their ears during future visits, effectively becoming walking, blinking advertisements for the new product. As a note, all three passholder events are now full. If you're already registered for the event and will have room for one or more passholder guests to join you, please post on our MousePad discussion forum. Likewise, if were too late to RSVP but you're planning to be at the resort on one of the event dates, post a request. Our community has done this for several past events, and we're always impressed by how generous our readers are. For those passholders who can't attend the event, Disney is also offering a special Glow with the Show hat, pin and lanyard combination for $40 at several DCA stores. The pin and lanyard match the pattern of the Glow with the Show ears, and can not be purchased separately. ...Disney is testing a new social media tool at Disney California Adventure, launching a new @DCAToday Twitter account Facebook page. The accounts are monitored throughout Disney California Adventure operating hours, and can reply to questions about entertainment schedules, character appearances and dining options. Nightly at Cars Land in Disney California Adventure, the neon along Route 66 while "Sh-boom" plays in the background. MousePlanet video by Tony Phoenix and Adrienne Vincent-Phoenix. …The MousePlanet Newsletter is here! The newsletter contains a recap of the week's articles (in case you miss a day), news that may have developed since the weekly Updates were published, and tips about what's happening at the Disney theme parks for the coming weekend. We'll also include a fun MouseAdventure bonus, such as an Eye Spy or a trivia question. To subscribe to our free newsletter, go to the MousePlanet main page and enter your email address in the top right box labeled "Join the MousePlanet Newsletter." Click Join, then fill out the fields in the registration page, including your first and last name. The Newsletter is free, but you must complete this registration to receive it, even if you may have signed up for one with us in the past. …Visitors planning trips to the Disneyland Resort should make a point to check the Current Refurbishment/Attraction Closures section each week for the most recent updates. The Disneyland Resort Web site currently only publishes refurbishment information about six weeks in advance. Be sure to check the most recent Park Update (link) for the latest changes, as MousePlanet does not edit past Park Updates to reflect changes. THIS IS AN EMPTY BOX! Please do not pay attention to any printing you may see in this box. We only wrote this to let you know that this is an empty box. With nothing in it. Except this message. Team MousePlanet is back for our fifth year at the CHOC Walk in the Park, benefiting Children's Hospital Orange County. Thanks to the efforts and generosity of our readers, Team MousePlanet has raised over $27,000 for CHOC since 2008. The 2012 race is Sunday, October 14 at the Disneyland Resort. Registration is now open—visit the CHOC website to join us! You can also visit our MousePad discussion forum for more information about the walk and our team. Team MousePlanet is looking to form a group to volunteer during the Disneyland Half Marathon Weekend, August 30 to September 2, 2012. Non-runners are welcome. Visit our MousePad discussion forum for additional information. Note: Not all of these have been officially confirmed by Disney, and are all subject to change at any time. We recommend checking for updates as you plan your visit. Disney Gallery – closed June 28 & 29 to install a new exhibit. Plaza Gardens – closed until winter 2013 for the construction of Fantasy Faire. Note: Refurbishment schedules are estimates only. All information is subject to change without notice. To get the most recent updates, call Disneyland at (714) 781-7290. Check here to see if a large convention, competition or park event might fall during your next trip to the Disneyland Resort. If you know of any in-park events, official or unofficial, that should be listed here, please send us an e-mail (link). Paint the Way to Miracles & Magic – Saturday, June 23. During this annual fundraiser for Children's Hospital Orange County, 192 participants will help paint one of two tile murals that will be displayed in Downtown Disney for the year. Registration is $50 per child. Destination D: 75 Years of Disney Animation – August 11 and 12. This D23 event returns to the Disneyland Resort in 2012. Additional details and registration information at www.Disney.com/D23. 5th Annual Taste of Downtown Disney – Thursday, August 16. This annual fundraiser for Children's Hospital Orange County includes appetizers and wine tasting at several participating Downtown Disney restaurants. Registration is not yet open, check back for additional details. 2012 Disneyland Half Marathon Weekend – August 31 – September 2. Event is now sold out. for more information about the walk and our team. 2013 Tinker Bell Half Marathon Weekend – January 18–20. Registration is now open. June 5, 6, 7, 12, 13, 14, 19, 20, 21. The 2013 event includes admission to Disneyland and Disney California Adventure during regular operating hours, and a private party in Disneyland after the park closes to the public for the night. D23 Expo – August 9–11. Tickets for the three-day convention go on sale August 9, 2012. We also recommend checking the convention calendar at the Anaheim/Orange County Visitor and Convention Bureau Web site (link). When looking at that site, remember to note both the number of people and the number of rooms resulting from each convention. A gathering of 25,000 people booking few room nights (indicating most will be driving in to the area for their meeting) can impact traffic around the Resort much more than a crowd of 25,000 staying in area hotels. Of course, that second group is going to make finding a hotel room more difficult (and possibly more expensive), so it's best to book your own room as early as possible if you see that a big convention is in town during your trip. Disneyland prices as of May 20, 2012. Note: MousePlanet does not edit past Updates to reflect price increases; for up-to-date prices check the most recent Disneyland Resort Update. Several current promotions offer discounted admission to the Disneyland Resort. For your convenience, we have grouped the discount offers based on the number of days the tickets are valid. Check out the category that best matches the amount of time you plan to spend at the resort, and pick the offer that works best for you. And keep those tips coming—let us know if you find a better or different offer, so we can share it with other readers! This first section is a list of discounts on ticket–only purchases. Though it has become more common in recent years, Disneyland tickets are rarely offered at deep discounts unless you are a resident of Southern California or Northern Mexico. For residents outside that area, the best discounts available tend to be simple advance purchase discounts. If you know of any additional discounts, offers, promotions, or contests that should be listed in this section, drop us a line. Note, we are no longer listing offers from the Anaheim-Orange County Visitor & Convention Bureau, as their convenience fee negates any savings. No discounts currently available to the general public. Check with your employer, school or credit union to see if any discounts are available through them. Disney Military Promotional 3–Day Park Hopper Ticket ($95) – A discounted price offered to active or retired U.S. military personnel or their spouses. Based on past offers, Disney defines "Eligible Service Members" as active or retired members of the US military, including active members of the National Guard or Reservists and active or retired members of the US Coast Guard. This discount is available at MWR/ITT offices at your military base, or at the Disneyland Resort ticket booths. Valid military ID is required. The price is the same for adults and children, and total of six tickets may be purchased per military member, regardless of who purchases the tickets (the member or their spouse). Tickets must be purchased by Sept 30, 2012. The ticket has the following blockout date: July 4, 2012. As far as we can tell, there is no "fuse" on this ticket, so you may have more than the standard 13 days from first use to use the remaining two admissions, but we highly recommend you contact your base MWR/ITT office for more details before making travel plans. Please note that this ticket is not a "bonus" ticket, and so does not include an early admission day. Check with your employer, school or credit union to see if other discounts are available through them. No longer offered by Disneyland. Some travel providers may offer 6-day or longer tickets to international customers as part of a package; residents of Canada, Australia or the UK should check with local travel agencies to see what options may be available to you. No discounts currently available for new purchases. California residents can take advantage of the monthly–payment plan when purchasing any but the Premier Annual Passport. 2012 Southern California CityPass ($279/$239) – This pass includes a 3–Day Disneyland Resort Park Hopper Bonus Ticket (including one early–entry day), a one–day admission to Sea World San Diego and a one-day admission to Universal Studios Hollywood. The CityPass expires 14 days after first use at any location, and the first use must occur by December 31, 2012. Purchase CityPass through the Disneyland Website or on–site at the ticket booths of Disneyland Resort or the other theme parks included in the pass. You can also purchase directly from the CityPass Website, though a shipping charge may apply depending on how quickly you need the ticket. 2012 Southern California CityPass PLUS ($311/$263) – This pass includes a 3–Day Disneyland Resort Park Hopper Bonus Ticket (including one early–entry day), a one–day admission to Sea World San Diego and a one-day admission to Universal Studios Hollywood, PLUS one–day admission to either San Diego Zoo or San Diego Safari Park. The CityPass expires 14 days after first use at any location, and the first use must occur by December 31, 2012. This upgraded pass is only available for purchase directly from the CityPass Website. Costco Travel Packages – Many different travel packages including visits to Disneyland and Disneyland hotels are available through Costco. When purchasing a Costco Disneyland travel package, extras that will be included are: Mickey's Toontown Madness admission (currently available Mondays, Wednesday, Fridays, and Saturdays), a character breakfast collectible pin and lanyard, and a Costco luggage tag per person, plus a $20 Disneyland Resort gift card per package. Disney's Resort Magic and Good Neighbor Magic Packages – Package includes accommodations one of the three resort hotels or at one of 40 Good Neighbor hotels; Souvenir Park Hopper ticket with voucher for admission to Mickey's Toontown Morning Madness, plus one Magic Morning (early entry) for three–day or longer Park Hoppers; preferred seating at three DCA attractions (Disney's Aladdin – A Musical Spectacular, Muppet*Vision 3D, It's Tough to be a Bug! ); Preferred Showing of Turtle Talk with Crush (Priority Viewing at the first Turtle Talk with Crush show of the day, on any one day – one voucher per Guest); Disney Dream coin keepsake (one per package), luggage tag and lanyard with pin; a Downtown Disney Fun Card; and a "Character Call" from Mickey, Minnie, Goofy or Crush. Contact Disney Travel or your favorite travel agent. Annual Passholder offers – Disneyland has once again extended the 20% merchandise discount offered to Premium annual passholders. The discount is now valid through December 31, 2012. Mickey tote bag for $15.95 with a minimum purchase of $25. Pin Trading Starter Set for $18.95 with a $40 purchase. Mickey tote bag for $13.95 with a minimum purchase of $25. Mickey Mouse watch for $17.95 with a $40 purchase. Expandable duffel bag for $17.95 with a minimum purchase of $25. Coastal tote bag for $15.95 with a minimum purchase of $25. Character Dining Vouchers – Discounted character dining vouchers are available for purchase online, in advance of your trip, through Get Away Travel. Disney Visa – Cardholders have access to a private Character Meet 'N' Greet photo opportunity at Disney California Adventure, and receive one free 5x7 photograph per visit. Cardholders also receive 10% off qualifying merchandise purchases of $50 or more from Disney–operated retail stores, 10% off at selected Disneyland Resort restaurants, (Big Thunder Ranch, River Belle Terrace, French Market, Cocina Cucamonga, Steakhouse 55, PCH Grill and Storyteller's Café), and 20% off the "Welcome to Disneyland," "A Walk in Walt’s Footsteps," and "Discover the Magic" guided tours. See the Disney Visa website for terms and conditions. Landry's Select Club – Members of the Landry's Select Club get priority seating at the Rainforest Cafe when available (which makes a huge difference on busy days), and a 10% discount on retail purchases. This club replaces the former Rainforest Cafe Safari Club as of March 31, 2012. If you are already a Safari Club member, you can migrate your membership to the new Landry's Select Club at no charge, and start to earn points in the new program. All Safari Club points and benefits expire on March 31, so if you have any gift certificates left to redeem, you have just a week to do so. The new Select Club eliminated the entree discount and free appetizer offer that was included with the Safari Club, replacing them with a point–based system that gives you a $25 gift certificate after you spend $250. If you are not yet a member of either the Safari Club or the Landry's Select Club, you can pre–purchase your membership before your trip. Membership now costs $25, but comes with a $25 reward. ESPNZone MVP Club – Membership in the MVP Club does not offer any discounts on food. However, once a member you can make an online reservation for your party up to three days in advance and will get a 25% increase in points purchased when playing games in the Sports Arena (and 40 bonus points at activation). You must register online and your membership card will then be mailed to you within two weeks. The card must then be activated at any ESPNZone by the person who signed up for the card and ID will be required (link). Visit the Park Hours section of our Disneyland Park guide for additional details about Magic Morning and Toontown Morning Madness, including available attractions. Entertainment schedule: Go directly to the Disneyland Resort schedule for this week at Disneyland.com here. Dancin' with Disney sounds interesting although I wonder how successful they'll be at keeping parents from mobbing the characters to get a photo. Thanks for all the coverage over the festivities, to the whole MousePlanet, krewe! ETA: They showed the Time Travel Cars Short over the weekend (I think on ABC) at the end of Cars. It was really cute. They also had Larry the Cable Guy doing 'commercials' for Cars Land throughout the broadcast. We were in there long enough Saturday to watch both character sets, and each character has a handler to help deal with photo-hounds and autograph-seekers. I'm wondering how many CMs they took to handle crowd control on friday. We saw several characters at DL without handlers. Brer bear even asked me what time i was and walked behind us 3 kiddos and showed that would be the end of his line, he was going in. All by his lonesome, it was kind of sad. I and Whistler found the new sleds uncomfortable, and hard to get out of as the bottoms are now flat in addition the the reduced leg room. we didn't have much of a ise from the floor to the seat before but it was enough tho help with comfort in leg room and being able to get up. Great report, and thank you very much for all of the construction updates an pictures over the last several years as well. Good update. I wish i could have been there for the opening of Cars Land and Buena Vista Street in DCA! I thought the Mad T Party REPLACED ElecTRONica? 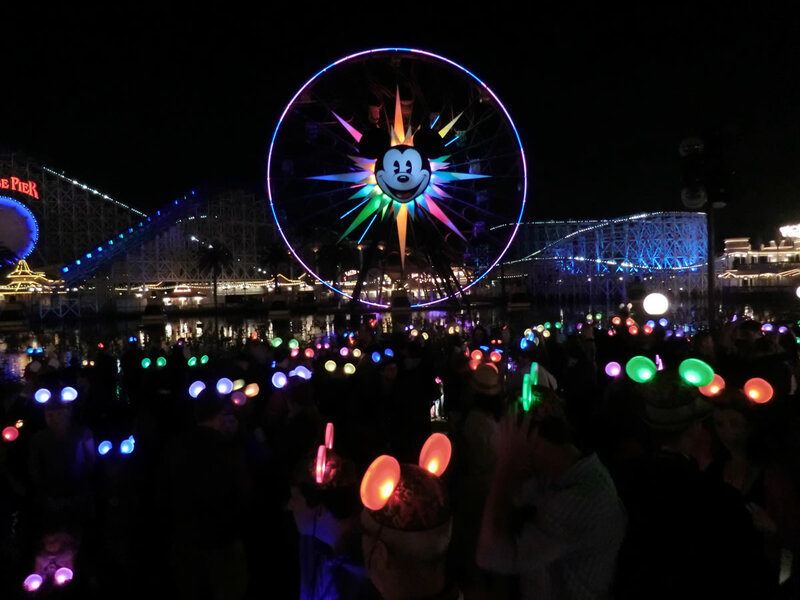 reported last week that Disney had invited passholders to try out the new Glow with the Show ear hats during upcoming after-hours performances of World of Color. I described the event as a test, which sources in merchandise tell me is not the case. The new ear hats went on sale to the general public last Friday, and the interactive feature is now active at ElecTRONica and the Mad T Party, with readers reporting that the ears also seem to react to some locations in Cars Land, as well as to the Soundsational Parade in Disneyland.